1884-1892 autograph album that belonged to Ida Mills of Bath, New York, before and after her marriage to E. B. Crowe. Signers mentioned what I believe to be Sonora, New York, and Sanova, New York. I may have misread some of them, or all of them. 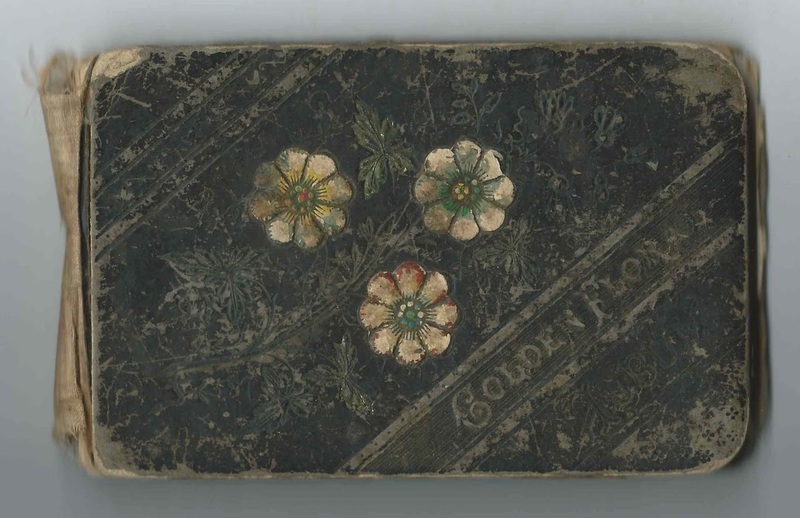 The album, in rough condition, measures approximately 6" x 3-3/4" and contains the sentiments of 38 of Ida's relatives, in-laws and friends. An alphabetical surname list and an alphabetical list of the signers, together with any personal information they offered, appear at the end of this post. Many of the names are hard to decipher, so I may have gotten them wrong. Ida Mills was born September 7, 1868 at Ottawa, Michigan, the daughter of Aaron and Aurilla (Moss) Mills. One of Ida's siblings, sister Lydia P. Mills, inscribed a page in her album, a page shared with Edd Burd and Frank M?. Lydia and Edward E. Burd married about 1897. Edward's mother, Sarah Ann (Mills) Burd, was the sister of Ida's father Aaron Mills. Two other people named Burd signed pages in the album, one of whom, Mary M. Burd, called herself Ida's cousin on the page inscribed at Hammondsport, New York, on November 19, 1884. A Mel Burd of Hammondsport, New York, also inscribed a page. And two other people names Mills inscribed pages in the album: Edward Mills and Henry J. Mills, both of Savona, New York. Although I haven't found an actual marriage record, it appears that Ida married E. B. Crowe during the 1884-1885 time frame of the album. One signer, Augusta Ames, mentions Ida's recent or upcoming marriage on the page she inscribed at Savona, New York, on July 30, 1884. E. B. Crowe himself signed a page as "Your Husband", on "1-3-1885" at Sonora, New York. I believe he was Eli B. Crowe or Crow, son of William and Emily Crow/Crowe of Bath, New York. One signer, G. Crow, called himself Ida's brother. Assuming that E. B. Crowe was Eli B. Crowe, the signer may have been Germaine Crow/Crowe of Bath, New York. Eli had a sister Mary Crow/Crowe. She may have been the L. Mary Crowe who inscribed a page at Bath, New York, on August 30, 1885. By 1900, Ida was living with her parents at Urbana, New York. She was listed as married, but E. B. Crowe was not listed in the household. She's still shown as married in the 1910 and 1920 Censuses, living with her widowed mother Aurilla (Moss) Mills, again with no E. B. Crowe listed. F [?] Rivkin inscribed a page with a beautiful design on May 23, 1884. He called himself a "Stranger", so he may not have been from Steuben County, New York, or even from New York at all. E. B. Crowe, signed on "1-3-1885" at Sonora, New York; "Your Husband", presumably Eli B. Crowe or Crow. Hurman Dutton, signed at Bath, New York, in April 1884. F. Rivkin, signed on May 23, 1884; initial. Beautiful design.